A collaboration between UCSD M.F.A. Candidate Sam Mitchell and Dr. Raymond Simmonds, Ph.D., an experimental physicist working with superconducting quantum circuits at the National Institute of Standards and Technology (NIST) in Boulder, CO. Sam and Ray have been friends since their undergraduate college days more than 20 years ago, at U.C. Santa Barbara. Sam was pursuing dance and dramatic arts and Ray’s interests straddled the arts, theatre, and the sciences. Sam introduced Ray to modern dance when he choreographed a septet based on Garcia Lorca’s “Poem of the Deep Song” casting Ray as one of the dancers. This experience not only affirmed their friendship, but planted the seeds for this collaboration. Sam’s work has slowly moved towards incorporating mathematics and algorithms into the process of choreography. While surfing at Scripps pier, a conversation started about Brian Eno’s self-generative music, quantum physics, randomness, mathematical equations, algorithms, dance choreography and dance theatre. Sam and Ray have taken some of the probabilistic rules that govern quantum systems and integrated them into a creative process for dance choreography and design. The results have spawned from an artistic aesthetic and an algorithmic code that produces dynamics that try to embody randomness, concepts of “quantum entanglement”, and the effects of observation or “measurement”. Using the simple harmonic oscillator as a model quantum system, they’ve tried to capture its quantum behavior through the performers in the dance space. This is the premiere of “Dunamis Novem”. “Quantum Statistics: Affects on Human Dancers and the Observer” Abstract: The Arts and Sciences may seem to be immiscible fields of study, even at odds with each other. In Leonardo Da Vinci’s time these two fields were not polarized, in fact, they coexisted naturally. Despite the appearance of being far distant cousins, both artists and scientists share a creative gene, a passion for their work, and a brave curiosity that pushes them past current boundaries to explore the unknown. 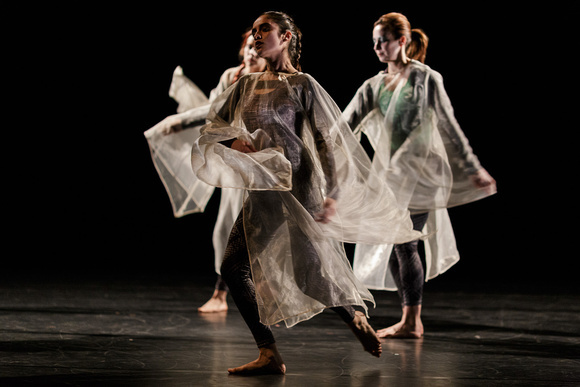 In this lecture, we will present some recent examples of those mixing these two worlds and our own attempts to do so with Dance Theater and Quantum Physics. While quantum mechanics is a well-established theory, proven true overwhelmingly by experiments, it is still confounding to most people, even those in science. At its heart, it describes nature in terms of possible realities with probable outcomes, with almost no predictable certainty. Experts still struggle to interpret its philosophical consequences and the notion that there may be no “objective reality”. Even Albert Einstein, one of its co-creators, disapproved of its bizarre properties, saying that “God does not play dice with the universe”. In the creation of this work, “Dunamis Novem”, we have taken some of the probabilistic rules that govern quantum systems and integrated them into a creative process. The results are then born from an artistic aesthetic and an algorithmic code that produces dynamics that embody in some way randomness, concepts of “quantum entanglement”, and the effects of observation or “measurement”. Our work shows that “Science” can inspire and direct new forms of “Art”, and we hope that the liminal world of “Art” can be an effective medium to transmit the sometimes counterintuitive results of empirical “Science” to a broader audience, also generating a dialogue between the two. We will describe the scientific concepts that currently inspire us, the process by which we convert quantum principles into movements, and the challenges of distilling this into a theatrical setting. Here is a link to the recorded Powerpoint presentation.